I’ve had the title of this blog post swimming around in my head for weeks. 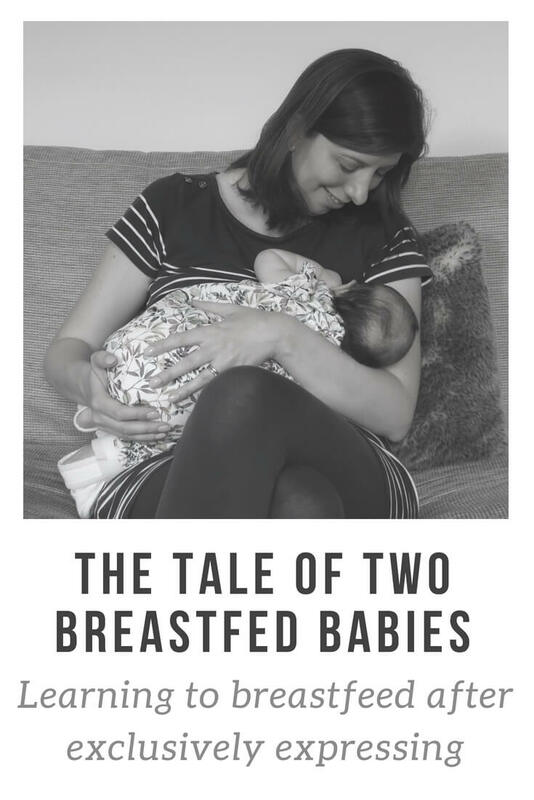 But now that I’ve typed the words and seen them on the screen, in black and white, I wonder if they convey, in any sense at all, the huge difference between my two breastfeeding experiences. With M, I was unable to breastfeed her properly. I vividly remember being told by the midwives that there was nothing wrong with her latch. Well if that were the case, why was I crying out in pain each time she latched on? I think they though I’d was being a wimp, but I’m more than capable of gritting my teeth and getting on with a moderate level of pain. In fact, that’s what I did do. We went home with a fully breastfed baby. Then the midwife came. She told me I was doing it wrong (probably the worst thing that anyone could say to perfectionist me!) and told me I should use the rugby ball hold. Now I bloody hate the rugby ball hold. I find it physically impossible. The midwife insisted that it was the answer to every C-section mum’s breastfeeding problems and used her pair of hands as well as my pair of hands to put M to my breast. The midwife also weighed M and told me that she’d lost too much weight and go on a feeding plan. The long and the short of this story is that M wasn’t feeding from me for long enough. I panicked, put some expressed breastmilk in a bottle and M gulped it down. And that was that. I exclusively expressed for seven and a half months, before combi feeding while I weaned myself from the pump. With B, I was determined for the story to be different. We had immediate skin to skin in theatre (after a rather interesting C-section) and B was put to my breast in theatre. Already it felt like a completely different experience to M’s birth. But then B was whisked off to NICU for five days. I had to fight to stay in hospital as I felt that without the support to get breastfeeding started before I went home, I would fail again. Fortunately, I managed to avoid being discharged by the skin of my teeth, and B was discharged from NICU to the postnatal ward to be with me. We spent another two days there with a brilliant team of midwives and MCAs who supported me to breastfeed. I left feeling confident that B and I both knew what we were doing. I can’t thank those ladies enough, as they were there for me whenever I needed them, both with reassurance and practical advice. Now here we are, three months on and still going strong. B still hasn’t ever fed from a bottle (although I think we’re going to need to give that a go soon, so I’m not tied to her 24/7!) and I’m so proud that I’m managing to breastfeed her successfully. One thing that has really stood out for me is how easy I’ve found it to breastfeed B. It’s like she just knew exactly what to do. I think there are two things to be taken from this. Firstly, if you’re a mum who would like to breastfeed a second or subsequent child having been unable to before, then don’t give up hope. It is possible. Secondly, if you’re a mum who found breastfeeding a doddle, then please don’t assume that everyone else is the same. I can imagine that if I’d only had the experience that I’ve had with B, I’d be in danger of thinking that breastfeeding is easy and I might not be able to understand why some people say that they can’t. But those early days and weeks with M taught me that it’s really not that simple. I love breastfeeding B and wish that I could have done the same for M, but at the end of the day, I’ve done my best for both of them, and that’s what’s important. "Ponderings on Two – Advice from Mummascribbles"